Many school-aged students are very sensitive to the cleaning supplies and the equipment used by janitorial services. As a result, different cleaning methods have to be implemented. The cleaning products and the equipment have to be changed depending on the ages of the children and the type of facility at the school. More and more, commercial cleaning companies are relying on ‘green cleaning products’ to clean the school bathrooms. These products have fewer odors and fewer harmful chemicals. Green Cleaning Product Distribution companies will come out and train the custodians on how to use their products properly. Finding a ‘green product’ that will get rid of the different types of graffiti marks on walls can be difficult. Sometimes, painting the wall is the only recourse. A common problem in school restrooms is toilet overflows because students put unorthodox items in toilets. Restrooms that use paper towels often find these clogging the toilets. Also, there have been reports of whole fruits (a popular healthy alternative provided by school nutrition services) being flushed down toilets and causing the pipes to be blocked and the toilets to overflow. The costs of the cleaning and the water damage can be expensive. Because of this, many commercial cleaning companies have started using hand dryers instead of paper products in the school bathrooms. Frustrated janitorial service workers have also started to ask the nutrition services to serve slices of fruit instead of whole fruit. Paper products and whole fruits can be flushed down the toilets by the students causing them to be blocked and overflow. 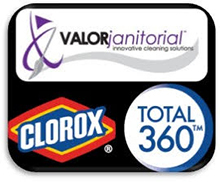 Cleaning restrooms in schools present specific cleaning challenges to janitorial services. These obstacles can be eliminated.